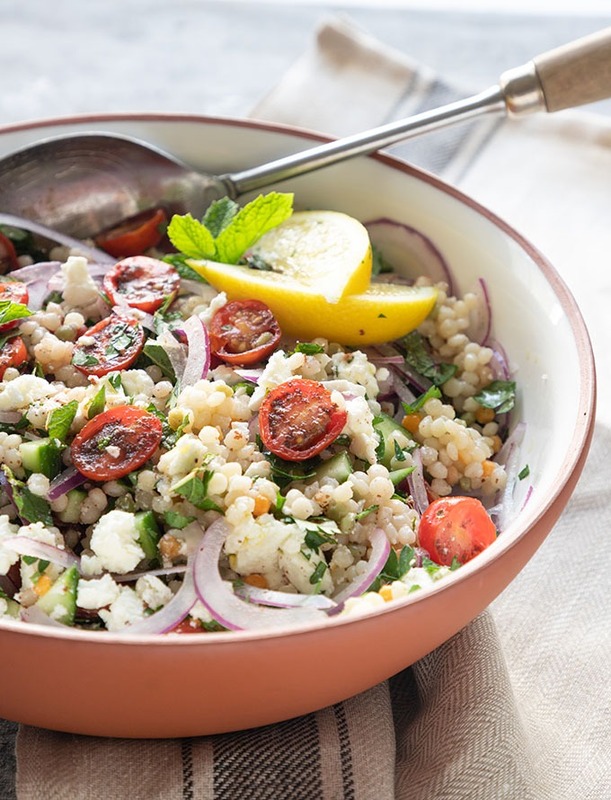 Light and zesty, this Israeli couscous salad is perfect for summer entertaining. 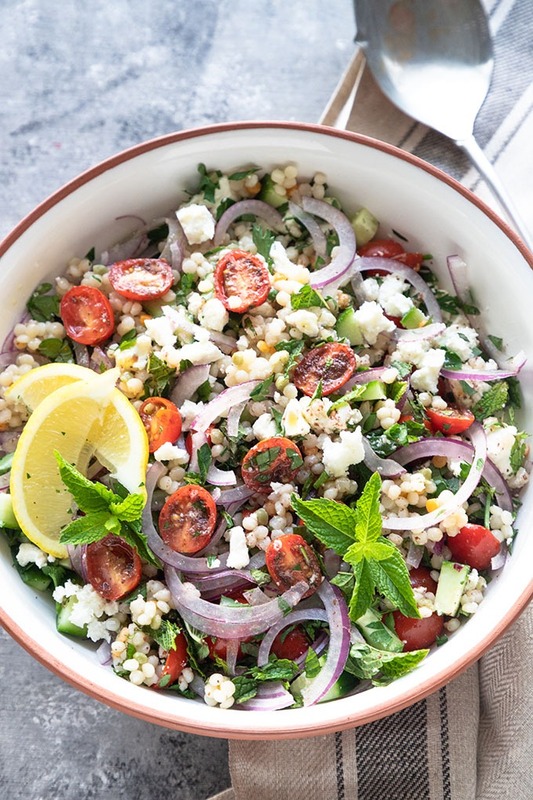 With the fresh flavors of herbs, combined with juicy, lemony tomatoes and brought together with the chewy texture of the Israeli couscous, this salad is freshness at its best! This salad is irresistibly delicious! I think I just found my new favorite salad! Seriously, it is that good, I wish I’d thought of it at the start of summer, rather than the end, because I’m pretty sure it would have been my weekly go to salad for dinners and lunches, it is that good! I’ve made it twice in the last week. The first time I made it, Adam gave me that look of ‘oh shiittt this is a good salad’ so I knew I had a winner. He has dubbed me ‘salad queen’ in our household, more so after I made up this salad recipe! He can have his title of risotto master, I’ll gladly take mine! Everyone needs a good salad in their lives, you can find my entire salad collection here! Like most of my recipes, I’ve relied on the produce doing the talking with the flavors, and the flavor combination you get from these ingredients in unbelievable! 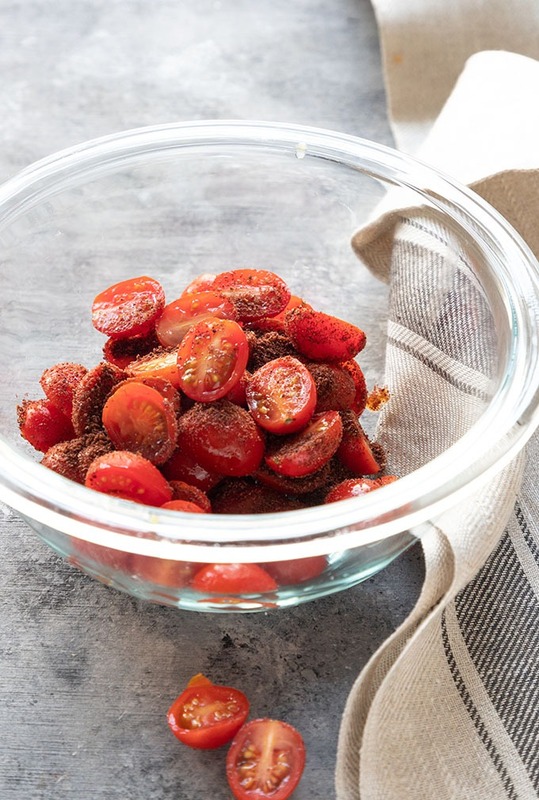 You won’t believe how much freshness and deliciousness can come from just a few simple ingredients like tomatoes, sumac, spices, lemon and fresh herbs! It’s a knock your socks off kind of flavor hit! Unlike ‘regular’ couscous, Israeli, or pearl couscous is a rounder, heavier type of couscous, almost comparable to a pasta like orzo. 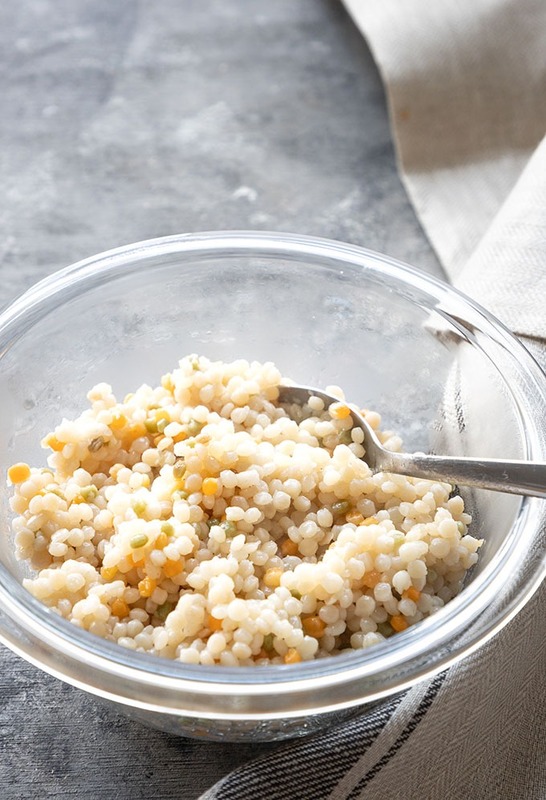 I actually prefer Israeli couscous to regular couscous, as it works wonders in salads and as a side dish, and just adds a bit more depth to a salad that I love. I love using regular couscous as a base for Moroccan dishes like tagine or stew, but Israeli couscous brings a bit more oomph to dishes. It’s really easy to make, and the cooking process is very different to regular couscous. Instead of steeping the couscous in hot water, then fluffing it up like you would regular couscous, you actually boil Israeli couscous in a saucepan before the fluffing process! It is a little sticker and gelatinous however, so it is better to work quickly and serve this salad almost immediately. The flavors for this salad come from the fresh produce, which is another reason I love this salad! It is so unbelievably light and fresh, you won’t believe that it’s only a few ingredients. I think the biggest game changer is the way the tomatoes are prepared. The first thing you’ll do is to marinade the tomatoes in lemon juice and sumac. Sumac is a spice used typically in Middle Eastern and North African cuisine. It’s easy to find in most supermarkets in the spice section. The tomatoes become so juicy in the marinade, omitting the need for this salad to be dressed which is another bonus! Cucumbers! Damn cucumbers! Cucumbers are going to be the bane of my existence in America for as long as I live here!!! Hear my out here. The best cucumbers in the world are those small little Persian/Lebanese cucumbers, and I can NEVER find them here! We’ve had a few come in our imperfect produce box, and I’ve found a handful at the market, but they are not in supermarkets like they are at home! If you can find the Persian/Lebanese cucumbers (the tiny small ones, not the pickling ones), use them! You’ll need about two. If you can’t next best option is the long English cucumbers that are kinda skinny. Being a cucumber snob, they are the best two types to use to maximum the flavors of this salad! Finally, the red onion plays a most important part in this recipe. The intensity of the red onion does mellow out with the flavors of the lemon, sumac and tomato, but to ensure maximum tastiness, you’ll want to slice them AS FINELY AS POSSIBLE! No one like chunky onion or bad onion breath, so the finer the better! I firmly believe, that the herbs are the backbone to this salad and absolutely make it, the best it can be! 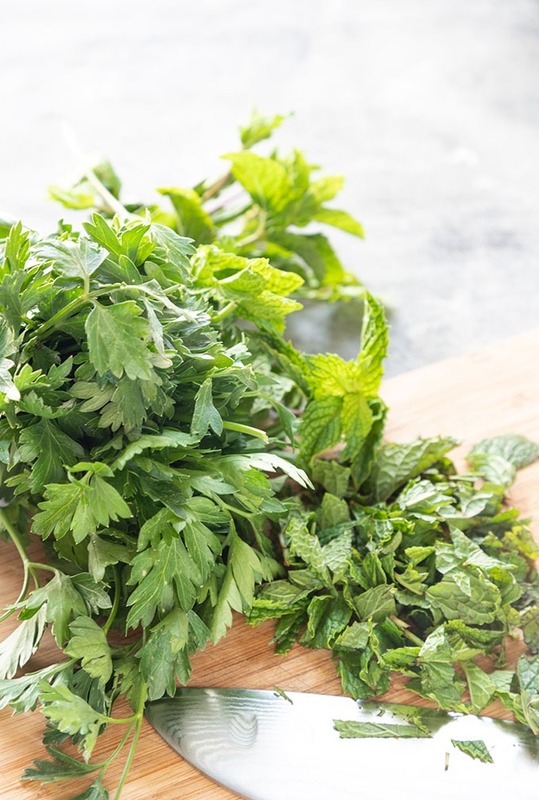 With herbs, you’ll want as fresh as a possible, and you’ll want to chop them as finely as possible. I hate having salads that have huge chunks of herbs, so the smaller the better. This recipe uses around a 1/2 a cup each of mint and parsley. This may seem like a lot, but this salad is massive by the time you add the couscous, so it levels it out. This is one salad that I would make the day off, but it does keep ok for the day after. As it is a predominantly chopped salad, the freshness is compromised the longer you leave it, so I’d suggest making it just before you want to serve it. It is that easy to bring together, even with the couscous cooking time, you’re looking at under 20 minutes. I love to add the Israeli couscous to the bowl and fluff up with a fork. Then add my vegetables, herbs, feta and toss. I also drizzle a little olive oil over the top of the salad before serving, and save some of the fresh herbs for garnish. If you’re finding your Israeli couscous is sticking too much, add a dash of olive oil to the couscous instead of the finished salad and use a fork to separate it. This salad is perfect for everyday eating, or to serve as a side salad at a dinner party or barbecue. It’ll also make a great pot luck salad too! This is the easiest recipe to make, and coming in at under 20 minutes, it’s a no brainer if you need something quick and fuss-free. 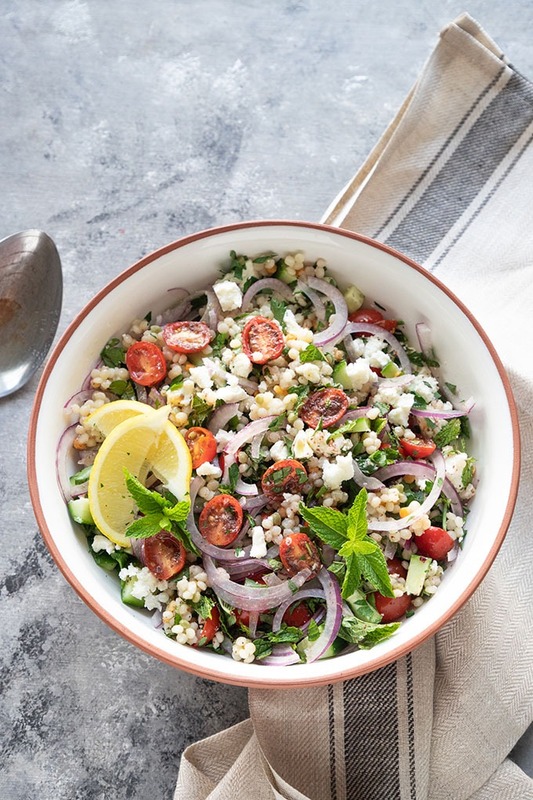 This Israeli couscous salad is so light and fresh, you won’t believe the flavor you get from 9 simple ingredients! 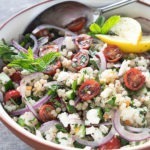 Israeli couscous salad - a zesty, fresh and flavorful salad made from simple supermarket ingredients. Simple doesn't mean boring when it comes to this salad, let the produce speak for itself! Bring the water and pinch of salt to the boil. Add couscous and bring to the boil. Reduce heat and simmer for 8-10 minutes until couscous is tender and water has absorbed. Remove from the heat, and use a fork to 'fluff up' the couscous. Break up any larger pieces, then set aside in a salad bowl to cool. 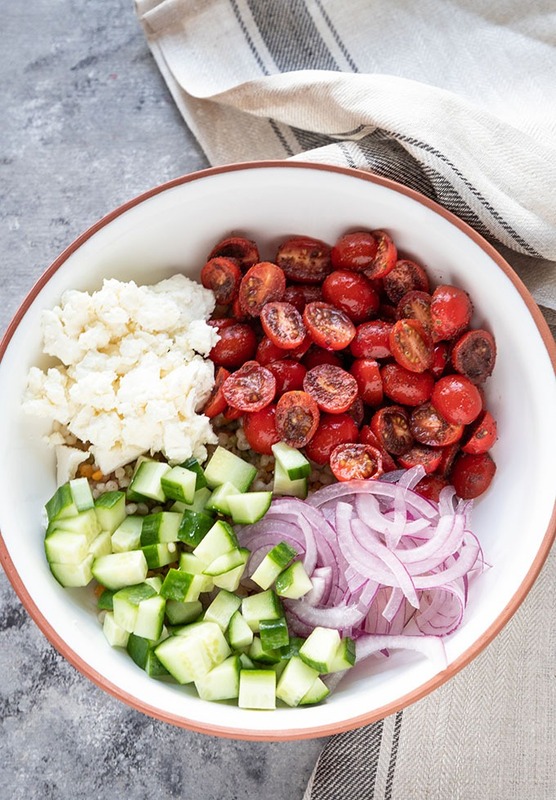 Place halved tomatoes, lemon juice and sumac in a small bowl and set aside to marinate while you make the rest of the salad. 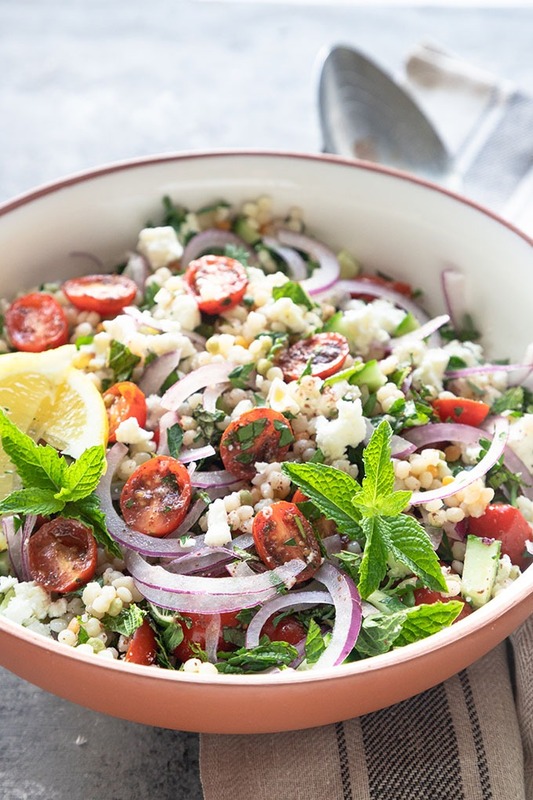 To make the salad, combine the couscous, tomato, cucumber, red onion, feta and herbs together and toss well. Add your drizzle of olive oil, then garnish with some leftover herbs. This looks so fresh and delicious! It’s the perfect side perfect for summer entertaining! I don’t think I’ve ever had a couscous salad but now I really wanna try this! it’s so so good! really bulks out the salad a lot it’s gorgeous! What a lovely, summery salad! I love working with sumac and fresh herbs so this salad is right up my alley. I do hope that Persian cucumbers come your way soon though. Those are my favorites too and luckily here on the East coast we have them in all our markets. that is so lucky!! and I managed to find them at Trader Joes!! So so happy!!! Israeli couscous is totally my new go-to for salads! I’m always looking for new inspiration for it, and this looks like a winner! Especially this time of year when the produce is so good! I totally agree Ann! The produce is amazing right now, I’m loving it! Yes! So perfect for summertime! Love all the light and bright flavours in this salad. Pass me a bowl, please! it’s my absolute favourite salad for the hotter weather!!! i’ll gladly pass you a bowl!